Piper PA-28-236, N2889D: FBI case file - New details of 2010 Stack plane crash into federal offices. Investigative file sheds light on Stack's finances, relationships and actions before crash. Austin, Texas. In the minutes before her husband rammed his small airplane into an office building, Sheryl Stack turned onto her street after spending the night at a hotel to see a huge black cloud rising from her house. Joseph Stack had been taunting her about his plan "to vanish," she would later tell investigators. She first feared that he had killed himself inside. "I saw the smoke billowing and said, 'Oh, my god, he's burned the house down,'\u2009" Sheryl Stack told them. "He had told me his life was over — that he was walking away and that I would never see him again." As she arrived at her burning home, Joseph Stack was not dead — yet. He was at the Georgetown airport hangar he rented for $300 a month, loading a 55-gallon drum with extra gasoline onto his plane and leaving behind a second barrel covered with threats scribbled on Post-it notes and addressed to the Internal Revenue Service. Those and other details are among new revelations in nearly 1,000 pages of documents in the FBI's Stack case file — all obtained by the American-Statesman last week through the Freedom of Information Act. The file revealed, for the first time, that the plane he crashed into a building that housed Internal Revenue Service offices had been a source of conflict with the government about whether he could consider it a taxable business expense. The documents referred to an audio interview Austin fire officials conducted with Sheryl Stack, and the newspaper separately sought copies of that tape, which provides the first glimpse into her reactions in the immediate aftermath. She has not publicly discussed the details of what happened and did not return calls seeking comment last week. After torching his home in February 2010, Stack flew his single-engine plane into the Northwest Austin office building, killing himself and a federal worker and seriously injuring several others. The crash sent a fireball through much of the Echelon I building and initially raised concerns from Austin to the White House about a possible act of terrorism. Recently made available for public release, the file provides the most comprehensive information so far about Stack's finances, which he blamed for his attack; his attitude toward government; and what he did that day. It includes interviews with more than a dozen witnesses who recounted the horror of seeing Stack's plane hurtling at full throttle into the building and statements from family members and friends whose opinions varied on the outward signs of his distress. The names of people FBI agents interviewed are redacted from the file. The records also add detail to the death of IRS employee Vernon Hunter, who, according to the documents, was on the phone with a fellow federal worker in Waco when Stack's plane plowed into his office. According to that worker, they were talking about new employee training when silence — and then "a very loud popping sound" — interrupted them and the phone went dead, an agent wrote. Documents also show that in the days after the attack, the FBI questioned a Lago Vista man who made anti-government remarks in an online chat room hours before the crash. A man in Alaska alerted the FBI about the comments after learning about the Austin attack. The commenter told agents during interviews at his home that "it was unfortunate that an innocent person had to die, but it was necessary." Federal agents later deemed that the man, who was not identified, did not know Stack and that Stack acted alone. "It is anticipated that no federal indictments are forthcoming," the file concluded. Records show that FBI agents from across the nation were drawn into the case, and through nine months of interviews after the Feb. 18, 2010, attack, they created a portrait of Stack: a 53-year-old software engineer at DAC International, an avionics sales and distribution company in North Austin, who lived in Arizona and California after college and moved to Austin sometime after 2001. He had been married for about 18 months to Sheryl, who was pursuing a doctorate in music from the University of Texas and has a young daughter in Austin. Among those who knew him even casually, Stack was open about his distrust of government and anger at the IRS. He never advocated violence, they said. Several told investigators that Stack frequently complained about having to release information that he considered private to employers and others. Delta planes clip one another on ground at Chicago O'Hare International Airport (KORD), Chicago, Illinois. 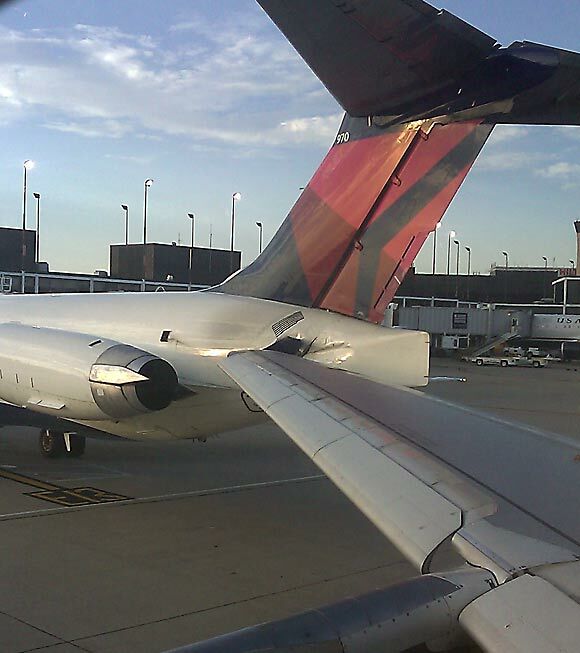 Two Delta jets made contact at O'Hare on Friday. It was anxiety at the airport Friday night as two planes collided into each other on the tarmac at Chicago's O'Hare Airport. A fire official told the Chicago Tribune that the two Delta planes were backing away from gates when they clipped wings. Delta spokeswoman Chris Kelly Singley confirmed that two planes had 'made contact' as they were getting set for take-off. She said the flights involved were Delta flight No. 2207 to Minneapolis and flight No. 1777 to Atlanta. No one was hurt in the incident, but passengers on both jets were forced to get off while airline crews checked the damage. Fire officials told UPI that there was no leakage of fuel from either of the planes' wing tanks. Passengers on the Minneapolis flight were reportedly bumped to flights later on Friday. One of the Minneapolis flight passengers was Chip Scoggins, a sportswriter with the Star Tribune newspaper. Some passengers on the Atlanta flight had to wait a little longer, as they were placed on new flights that took off as late as Saturday morning. Established in 1945, O'Hare Airport remains one of America’s busiest, serving nearly 80 million passengers each year. At least two dead after planes collide in Alaska. Ted Stevens Anchorage International Airport (PANC), Anchorage, Alaska. Updated 6:35 p.m.: Alaska State Troopers spokeswoman Megan Peters said that crews had been able to access the scene, and at least two --and possibly three -- passengers in the crashed plane appeared to be dead at the site. Two planes collided with each other at approximately 2:14 p.m. One of the planes crashed into the ground and became engulfed in flames after impact. The other plane was able to maintain flight and return to Anchorage where it performed an emergency landing at the Ted Stevens Anchorage International Airport. Then Anchorage Airport Police and Fire Department when staged at the runway with a crash response team. After the floatplane was on the ground it was confirmed that the pilot was the sole person on board and was uninjured, however, the float plane sustained significant damage. Troopers responded to the scene of the downed airplane near Amber Lake. The remains of 2 people, and possibly a third, were seen in the wreckage. The State Medical Examiner's Office is responding the scene to help extract the remains. The cause and circumstances surrounding the crash are under investigation. The NTSB and the FAA have been notified of the crash and are responding to the scene. 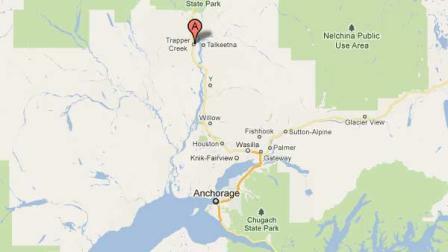 Amber lake is located at the end of Oil Well road which is off of Petersville Road in the Trapper Creek area. (Original story) The Associated Press (via the Washington Post) reported Saturday afternoon that two planes had collided in the air above Trapper Creek, causing one to crash. According to KTUU, the other plane, a single-engine Cessna that sustained damage to a float, managed to return to Anchorage after circling the crash site --and resulting fire -- of the other plane involved in the collision. The Washington Post said that the crashed plane was a Cessna 180, and there was no word yet on the passengers of that crash. KTUU also reported that the crash site was accessible by road, but crews trying to approach the crash were held back by ammunition popping off in the fire at the scene. At least two people are dead following a mid-air plane collision this afternoon near Amber Lake in the Trapper Creek area. Two planes collided with each other at approximately 2:14 p.m. One of the planes crashed into the ground and became engulfed in flames after impact. The other plane was able to maintain flight and return to Anchorage where it performed an emergency landing at the Ted Stevens Anchorage International Airport. Then Anchorage Airport Police and Fire Department when staged at the runway with a crash response team. After the floatplane was on the ground it was confirmed that the pilot was the sole person on board and was uninjured, however, the float plane sustained significant damage. SARASOTA -- The airline maker Boeing says their massive 'Dreamliner' airplane is the future of airline travel, landing the plane in Florida for the first time Friday night. The Boeing 787 test plane landed at the airport, marking the first time one of the massive planes touched down in Florida. On Saturday, dozens of people came to gawk at the plane. In the group of spectators, Scott Neary, along with his wife and two kids, stood in the summer heat in awe of the airliner. "We're all melting," Neary said, "but it's totally worth it." He thought it was worth it to see a state-of-the-art plane Boeing calls its 'Dreamliner'. It's a plane Boeing believes is the next generation for airliners. "Because of the composite material, because of the fuel efficiency, because of the fact that we used more electric power on this airplane than ever before - I think it really has changed the game," said Heather Ross, the chief pilot for the 787. After testing the plane in several countries around the world, the 787 made it's way to Sarasota-Bradenton Int'l Airport before heading home to Seattle. With larger and more heavily trafficked airports in the region, many wondered why Boeing picked Sarasota-Bradenton for the landing. "Why not Sarasota?" said Ross. "It's a beautiful location. We've never been to Sarasota before. It gave us the opportunity to come out and to show the airplane to the folks here in Sarasota." "Obviously, we're very proud to have that unique opportunity," said Rick Piccolo, President and CEO of Sarasota-Bradenton Int'l Airport. "We think it's a great place to come to, hopefully on a regular basis, from an airline." For Scott Neary, seeing the plane with his family was a history-making experience. "This is the newest Boeing jet," he said. "It'd be kinda neat someday to see my little girl flying that plane." The plane took off just before 1:30 p.m. Saturday afternoon, waving it's wings as it made it's way into the sky. The rescue team of the National Emergency Management Agency (NEMA) has retrieved the bodies of the three victims of a crashed helicopter on a mountainous area of Ife-Odan Village in Osun State. The incident that occurred on Friday afternoon took the intervention of NEMA operation office from Lagos and Abuja who spent over six hours trying to locate the helicopter after the initial alert sent by nomadic Fulani men and hunters. It was learnt that Osun Emergency Volunteer Groups and the police joined in the effort. The helicopter which belonged to a private operator, OAS Air Service had three passengers on-board, including a male pilot and two women. Meanwhile, the Director General of NEMA, Muhammed Sani-Sidi has sent an invitation to all airline and aircraft operators in Nigeria to an emergency meeting this week Thursday at the Sheraton Hotel Lagos, on the use of 406 MHZ Beacon for the purpose of Cospas-Sarsat Alerting system. He said the agency found it necessary to collaborate on the issue and take a clear position on the use of Emergency Locator Transmitters Beacon where it would be mandatory for any aircraft flying in Nigeria to install it. Following the tragic death of the managing director of Bacita Sugar Company, Josephine Kuteyi and two others in the crash, the Minister of Aviation, Stella Oduah, yesterday, commiserated with families of the victims. The development came even as the Accident Investigation Bureau said the remains of the victims had been deposited at the Ladoke Akintola University Teaching Hospital, Oshogbo. Meanwhile, the AIB has commenced investigations to unravel the cause of the unfortunate incident, just as the accident investigation team has promised to update the media on the crash. However, unconfirmed sources on Saturday claimed that late Mrs. Josephine Kuteyi, who reportedly died in the helicopter crash was on a trip to meet an official appointment with a high ranking officer of the Kwara State government when she met her ghastly death. Sources at the Ilorin International Airport expressed surprise over Kuteyi's death, saying she was a regular face at the airport as she always travelled in chartered flights or helicopters. One of the workers noted that even the team to receive her on Friday was on hand at the airport before hearing of the crash that occurred at Ife Odan in Osun State. One of the members of staff airport said she was seen on Wednesday when she came aboard a chartered flight from Lagos. In another development, investigators are considering why the late pilot of the helicopter that crashed in Ife-Odan, Osun state on Friday, allegedly failed to communicate with the Ilorin control tower before the accident. Sources familiar with the initial investigation disclosed to Sunday Tribune that since the helicopter was heading for Ilorin, the pilot should have initiated necessary communications to guide its movement. The source, who spoke under anonymity, recalled that immediately news of the crash filtered in, officials were drafted to the scene to undertake preliminary investigations. The source, who noted that the flight was coming from Iwo, said the pilot at no time made contact with Ilorin which was an unusual development. The historic Battle of the Atlantic is to be dramatically recalled by the return of seaplanes to the Northern Ireland base they used in the Second World War. The vast lakes of Co Fermanagh provided a watery runway for the flying boats and served as the perfect launch pad for their vital role in the Atlantic campaign. Pilots were allowed to secretly breach the Republic's war-time neutrality by skirting across Co Donegal as they flew into action. 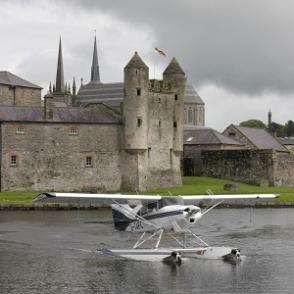 The Fermanagh Seaplane Festival is to attract various types of seaplanes from around Europe, but significantly the show will, for the first time, include one of the famous Catalina model of flying boats that used the Lough Erne base 70 years ago. Organisers are in contact with one of the original flying team who operated at the site but are now appealing for other surviving crew members to get in touch and take part in the event. Ted Jones, 88, originally from Nailsworth, Gloucester, but who has lived in Clontarf, north Dublin, for most of his life, said he is looking forward to flying along the so-called "Donegal Corridor" in a Catalina once again. "This has never been done before and it would be absolutely wonderful to do it again after all this time. At my age it really would be a special moment," said the war-time flying ace. "But sadly, obviously there is not too many of my fellow pilots and crew about these days, so hopefully the organisers will have some luck. It would be nice to have a few more old co-pilots join us." The big seaplanes were able to fly for ten to 12 hours, and so were particularly suited to the Atlantic coastal patrols so essential to the protection of the North American merchant ships. The planes were used in anti-submarine warfare, patrol bombing, convoy escorts, search and rescue missions and cargo transport. The Catalinas had a crew of eight, including a pilot, co pilot, three gunners, mechanic, radio operator and navigator. The planes could operate at long range, up to 2,350 miles. They were armed with five machine guns and could carry, 4500lbs of bombs, depth charges, mines or torpedoes. The festival runs from September 23-25. The airplane collided with terrain while maneuvering in dark night visual meteorological conditions while on the third leg of a 1,665 nautical mile (nm) cross-country flight. The airplane, with the pilot/owner and a pilot-rated passenger aboard, had departed the east coast in the morning and had been en route for about 16 hours. It could not be determined which of the two pilots was manipulating the flight controls at the time of the accident. The planned length of the last leg of the flight was 660 nm, which was about equal to the airplane’s calculated maximum range for a no wind condition with a 45 minute reserve. Radar data revealed that during the last few minutes of the flight, the airplane changed course several times toward different nearby airports. These heading excursions were most likely due to a decision by the pilots to divert to an alternate airport after realizing that the destination airport could possibly be beyond the current range of the airplane. The last radar return was about 0.1 nm south of the accident site, which was located in a remote, sparsely populated area. Examination of the accident site revealed signatures, including tree strikes and wreckage distribution, consistent with controlled flight into terrain. Postaccident examination of the engine and airframe revealed no evidence of mechanical malfunctions or failures that would have precluded normal operation. It is likely that the pilots lost situational awareness and failed to maintain terrain clearance. Conditions conducive to controlled flight into terrain included fatigue due to the pilots’ long duty day, the dark night light condition, the lack of ground lighting in the region, and the fact that neither pilot was instrument rated. The non-instrument-rated pilots’ loss of situational awareness during a dark night flight over a remote area, which resulted in their failure to maintain an altitude sufficient to ensure adequate terrain clearance. Contributing to the accident was the pilots’ fatigue due to their long duty day. On July 29, 2011, about 2100 mountain standard time, a Cirrus Design Corp SR20, N365DP, was substantially damaged after impacting terrain while maneuvering about 30 nautical miles (nm) southwest of Fredonia, Arizona, in the Kaibab National Forest. Both the private pilot and registered owner of the airplane, and commercial pilot/passenger, sustained fatal injuries. The flight was conducted under the provisions of 14 Code of Federal Regulations Part 91 as a personal cross-country flight. Visual meteorological conditions (VMC) prevailed at the time of the accident, and no flight plan had been filed. The flight departed from the Rock Hill Airport-Bryant Field (UZA), Rock Hill, South Carolina, about 0800 eastern daylight time (EDT), with its destination being the Henderson Executive Airport (HND), Henderson, Nevada. A family member of the private pilot reported to the National Transportation Safety Board investigator-in-charge (IIC), that the purpose of the flight was to reposition the airplane from UZA to HND. The family member further reported that she thought the flight departed UZA about 0800 EDT on the morning of the accident, but wasn’t entirely sure of the precise time. The family member stated that she spoke with the pilot that afternoon, who reported that he was refueling in Stillwater, Oklahoma, and would be arriving HND about 2130 or 2200 Pacific daylight time (PDT) that evening. The family member revealed that after falling asleep and awakening about 0300 PDT the next morning and realizing that the flight had not returned, she became very concerned and began making phone calls in an effort to locate the pilots. Law enforcement personnel reported to the IIC that in a conversation with a family member of the private pilot, the family member stated that the flight had departed from UZA at 0800 EDT. The family member further stated that the airplane had landed somewhere in the Oklahoma panhandle to refuel. The family member revealed that the commercial pilot called a family member at 2023 and said that they were going to refuel somewhere in Arizona before proceeding to HND. She added she thought that the commercial pilot had sent a text message to the family member at 2045. Law enforcement personnel reported to the IIC that in a conversation with a family member of the commercial pilot, she had received a text message from him stating that they planned to land at HND by 2130. The family member added that it was her belief that the airplane had not landed anywhere else to refuel after leaving Oklahoma. An alert notification (ALNOT) was issued by the Prescott Flight Service Station, Prescott, Arizona, about 0800 MST on the morning of July 30. The airplane wreckage was subsequently located that morning about 1000, 31 nm southeast of Fredonia, Arizona. It was determined by fuel receipts and witness statements that after departing UZA, the airplane landed at the Walnut Ridge Airport (ARG), Walnut Ridge, Arkansas, at about 1330 central daylight time (CDT); the distance between UZA and ARG was about 486 nm. After landing, the airplane was refueled by the pilot using the self-service fuel island with 50.1 gallons of aviation fuel; according to Cirrus Aircraft, the total usable fuel for the SR20 is 56.0 gallons. Witnesses reported that the airplane departed ARG about 1400 CDT. After departing ARG, the airplane proceeded westbound to the Guymon Municipal Airport (GUY), Guymon, Oklahoma; the arrival time could not be determined during the investigation. The distance between Walnut Ridge, Arkansas and Guymon, Oklahoma is about 512 nm. Guymon airport personnel stated that they didn’t think the pilots had eaten at the airport during their stopover, but they were not certain. A fuel receipt did indicate that the airplane was refueled with 44.2 gallons of aviation fuel, time stamped at 1851 CDT. Airport personnel did say that they thought the airplane departed about 1900 CDT. Radar data provided by the 84 RADES, Hill Air Force Base, Ogden, Utah, revealed the last 26 minutes of the accident flight covered a distance of 58 nm. During this period of time, the airplane was transmitting a 1200 transponder code, but was not transmitting MODE C (altitude) reporting information. From 20:28:55 to 20:54:10 (25 minutes, 15 seconds), data indicated that the airplane was flying a magnetic heading of 244 degrees with an average ground speed of 132 knots. At 20:54:10, radar data indicated the airplane turned right approximately 16 degrees, followed by an approximately 50-degree turn to the left 36 seconds later. From 20:54:47 to 20:55:24 (37 seconds), radar data indicated that the airplane’s magnetic heading was 210 degrees with an average ground speed of 116 knots. This heading was determined to be in line with the Kingman Airport (IGN), Kingman, Arizona, which was located about 115 nm from the airplane’s position at the time of the turn. From 20:55:24 until the last radar return at 20:55:36 (12 seconds), radar data revealed that the airplane had turned right about 90 degrees to a northwest heading. This heading was in line with the Kanab Airport (KNB), Kanab, Utah, which was located 34 nm northwest of the last radar return. The accident site was located about 0.1 miles north of the last radar return in the Saddle Mountain Wilderness of the Kaibab Plateau, a sparsely populated area about 20 nm north of the Grand Canyon National Park’s north rim. The airplane had impacted high standing trees at an elevation of about 8,900 feet msl, on a measured magnetic heading of 355 degrees. The energy path extended along the impact heading for about 385 feet, and extended over a lateral distance of about 110 feet. Subsequent to an on site survey of the wreckage and the surrounding area, the airplane was recovered to a secured storage facility in Phoenix, Arizona, for further examination. The private pilot, age 39, was the owner of the airplane and possessed a private pilot certificate with a rating for airplane single-engine land. A review of Federal Aviation Administration (FAA) records revealed that the pilot received his private pilot certificate on April 13, 2008, in a Cessna 172 airplane. According to the Airman Certificate and/or Rating Application submitted to the FAA examiner prior to his private pilot check ride, the pilot listed a total flying time of 73.4 hours. During the investigation, the pilot’s personal logbook was not recovered, and as a result his time in make and model, as well as a breakdown of other pilot times was not determined. A search of FAA records revealed that the pilot’s most recent application for his airman medical certificate was dated July 24, 2007, which was his initial medical examination for a student pilot certificate. A third-class FAA medical was approved on July 31, 2007, with 0 flight time noted. The commercial pilot, age 32, possessed a commercial pilot certificate with airplane single-engine land, airplane multiengine land, and airplane single-engine sea ratings. The pilot’s commercial pilot certificate was issued on July 16, 2009, and his FAA third-class medical certificate on May 15, 2008. At the time of his application for the medical certificate, the pilot listed a total flying time of 400 hours. A family member related to the NTSB IIC that at the time of the accident the pilot’s total time was about 600 hours. No breakdown of the pilot’s flight time was determined, as his personal logbook was not available during the investigation. The Cirrus SR20, serial number 1062, was a four-place, low wing, fixed tricycle landing gear airplane, manufactured in 2000. A Continental Motors, IO-360-ES series, 210-horsepower, horizontally-opposed six-cylinder engine powered the airplane. A review of the airplane’s maintenance records revealed that the airframe and engine’s most recent annual inspection was conducted on March 2, 2011, at a recorded HOBBS time of 2,468.0 hours. It was revealed during the inspection that the engine had accumulated 1,046.9 hours since its last overhaul. Additionally, maintenance records indicated that on March 22, 2011, the expired parachute and rocket motor were replaced with parachute CDC#14242-101, S/N 003130R1, and rocket motor CDC#26602-001, S/N 0197. A review of air traffic facilities revealed that there were no communications between the pilot and air traffic control on the day of the accident. At 2054 MST, the weather reporting facility at the Grand Canyon National Park Airport (GCN), Grand Canyon, Arizona, located about 34 nm south of the accident site, reported wind 210 degrees at 6 knots, visibility 10 miles, scattered clouds at 11,000 feet, temperature 22 degrees Celsius (C), dew point 11 degrees C, and an altimeter setting of 30.28 inches of mercury. At 2054 mountain daylight time, the weather reporting facility at the Kanab Airport, Kanab, Utah, located about 36 nm northwest of the accident site, reported wind 340 degrees at 8 knots, visibility 10 miles, sky clear, temperature 27 degrees C, dew point 8 degrees C, and an altimeter setting of 30.15 inches of mercury. At 2053 mst, the weather reporting facility at the Page Municipal Airport (PGA), Page, Arizona, which is located about 42 nm east-northeast of the accident site, reported wind 320 degrees at 3 knots, visibility 10 miles, sky clear, temperature 33 degrees C, dew point 3 degrees C, and an altimeter setting of 30.03 inches of mercury. A review of the weather by an NTSB meteorologist indicated that there was no evidence of “cloud” below 16,000 to 17,000 feet in the area of the accident site. These bases were obtained from the GCN METAR, which indicated clouds from 10,000 to about 11,000 feet above ground level, and that the tops of the clouds were roughly 22,000 feet mean sea level. The meteorologist added that there were no pilot reports (PIREPS) in the area that he could account for, and that there was some rain in southwestern Utah. The meteorologist further added that the meteorological data he reviewed was consistent with an environment that would not have been conducive to meteorological clouds; it was too dry. According to the U.S. Naval Observatory, Astronomical Applications Department, the phase of the moon on the evening of the accident was waning crescent with 1% of the Moon's visible disk illuminated. Moonset was at 1851 MST. An on site examination of the wreckage was conducted under the supervision of the NTSB IIC, who was accompanied by a representative from Cirrus Aircraft Design. A detailed survey of the wreckage revealed that all components necessary for flight were accounted for at the accident site. The airplane was located at an elevation of 8,869 feet msl, at coordinates 36 degrees 30.870 minutes north latitude and 112 degrees 09.768 minutes west longitude. The first identified point of contact (FIPC) was a pine tree, with broken branches estimated to be about 55 feet up the approximately 65-foot tall tree. Paint chips were observed on the ground along the energy path in line with the second point of impact. The energy path was measured to be on a magnetic heading of 355 degrees. A large pine tree with a piece of bark missing from its trunk was located 69 feet from the FIPC; there was also a piece of fiberglass imbedded in the tree trunk. Additionally, larger pieces of fiberglass, the right aileron, and green glass consistent with the right navigation light lens were located in the immediate vicinity of the tree. The tree scar was measured to be about 32 feet above ground level. Approximately 140 feet from the FIPC, a shallow crater was observed with various airplane components in the immediate vicinity. Further north, about 190 feet from the FIPC, several trees and the ground were observed to have been blackened with soot and ashes from a post impact fire. The flaps, left aileron and half of an elevator were located in the next 100 feet leading up to the main wreckage. Remnants of spot fires were also observed. The propeller was located approximately 280 feet from the FIPC, and was separated from the engine. The main components of the front crew seats were located approximately 342 feet from the FIPC. Pages from the Pilot Operating Handbook (POH) were the last items in the debris field, located about 385 feet from the FIPC. The debris field was approximately 110 feet at its widest point near the main wreckage. The cockpit and cabin areas were identified, and observed to have been consumed by fire and destroyed. No cockpit instrumentation was located for examination. The only component that was distinguishable at the wreckage site was the face of the altimeter, which read 30.47 inches of mercury and 1033 millibars of pressure. The main wreckage was located approximately 255 feet from the FIPC. It consisted of a large section of the aft left fuselage, the FS222 bulkhead, and the empennage, to include the vertical and horizontal stabilizers with their associated flight control surfaces. The carry-through wing spar, flight control cables, engine, and the inboard section of the right side of the wing were also observed in this area. The right wing was consumed by fire and impact damaged. A section of the right aileron, which was located about 120 feet southwest of the main wreckage, was bent and twisted, and exhibited no thermal damage. Its associated trim tab was not located. The right flap had separated from the wing, and was against a tree about 75 feet in line with the energy path and prior to the main wreckage. The flap was observed bent at a downward angle at about mid-span. The right wing fuel tank was consumed by fire. The left wing was consumed by fire and impact damage. The left aileron was observed separated, and found against a tree about 45 feet along the energy path and prior to the main wreckage. The aileron was bent and twisted, and exhibited no signs of thermal damage. The wing’s flap was located just west of the energy path, and about 45 feet from the main wreckage. The flap was bent and twisted, with no signs of thermal damage noted. The left wing fuel tank was consumed by fire. The empennage, which came to rest on the north edge of the main wreckage site, exhibited no signs of thermal damage. The rudder, elevators, and both horizontal stabilizers remained attached at various attach points. The rudder was observed split at mid-span. Both elevators sustained impact damage and deformation. Both stabilizers also sustained significant deformation. Elevator and rudder control cable continuity was confirmed. The front cockpit seats and seat tracks were found separated from the airplane, and exhibited impact damage and fragmentation. The rear seats were also fragmented. The nose landing gear attach point with the engine mount was located about 40 feet prior to the main wreckage site and in line with the energy path. The nose gear tire, which had separated from the landing gear structure, was found about 125 feet prior to the main wreckage site along the energy path. Both main landing gear were identified at the accident site. The left gear had separated from the left wing, while the right main landing gear remained attached to its wing. Thermal damage was observed to the right main landing gear. On August 1, 2011, an autopsy was performed on the private pilot at the Coconino Health Department, Office of The Medical Examiner, Flagstaff, Arizona. The findings of the autopsy revealed that the cause of death was as a result of blunt force injuries. The Forensic Toxicology Fatal Accident Report was prepared by the FAA Civil Aeronautical Institute for the private pilot. The report indicated that tests for Carbon Monoxide and Cyanide were not performed, and that no Ethanol was detected in Muscle or Kidney. Loratadine was detected in the Lung and Kidney. Loratadine is an over the counter non-sedating antihistamine that is used to treat allergies, and not considered to pose a significant hazard to flight safety. On August 1, 2011, an autopsy was performed on the commercial pilot at the Coconino Health Department, Office of The Medical Examiner, Flagstaff, Arizona. The findings of the autopsy revealed that the cause of death was as a result of blunt force injuries. Under the supervision of the IIC, an examination of the airframe and engine was performed by representatives from Cirrus Aircraft and Continental Motors, Inc. (CMI), at the facilities of Air Transport, Phoenix, Arizona, on August 11, 2011. The examination of the airframe revealed that all components necessary for flight were identified and accounted for. It was also determined that no pre-impact anomalies existed with the airframe that would have precluded normal operation of the airplane. The examination revealed that the engine had separated from the airframe and propeller assembly. The crankshaft propeller flange had separated from the engine, and remained attached to the propeller assembly. The magnetos, fuel pump, alternator, and vacuum pump were all observed to have separated from the engine. The cylinders were boroscoped. The piston heads and combustion chambers were observed to have light grey deposits. The valve heads were undamaged and had no signs of abnormal thermal discoloration. The number 1 and 3 valve head areas had an oil residue. The crankshaft was moved with the use of a pipe wrench and had approximately 5 degrees of rotation. The camshaft was rotated from the forward accessory drive with valve continuity confirmed. The cylinder overhead components were lubricated; numbers 1, 2, 4, and 6 cylinder were undamaged. The overhead components for numbers 3 and 5 had impact damage. Examination of both magnetos revealed that each had separated from the engine; their positions could not be determined. One magneto had impact damage to its housing and mounting flange. Small sections of the ignition leads remained attached to the magneto distributer cap. The magneto drive was rotated by hand, and the impulse coupling engaged. Spark was visible at the damaged ignition lead ends. Examination of the second magneto revealed that its distributor cap and attached housing had separated and were not available during the inspection. The magneto’s drive shaft rotated by hand. The vacuum pumps were found in the main wreckage and disassembled. The electrically driven vacuum pump had impact damage and was found partially opened. Small sections of the rotor were found in the cavity. The cavity was free of damage and chatter marks. The engine driven vacuum pump was observed separated from the engine and had impact damage to its mount. The drive coupler was intact, with minor impact damage noted. The pump was disassembled. The rotor was cracked in several sections. The cavity was free of damage and chatter marks. The propeller had separated from the engine, and the crankshaft propeller flange remained attached to the hub. The separated surfaces of the crankshaft propeller flange had 45-degree shear-lips and impact damage. The spinner had impact damage and was crushed aft revealing the piston dome. Blade A was bent aft near the shank and had S-type bending at the tip. Blade B was loose in the hub, and the blade surfaces had multidirectional gouging. The leading and trailing edges from the mid-section to the tip had gouging. Blade B was bent aft at the shank and aft again at the tip. The technician concluded that the inspection of the engine did not reveal any abnormalities that would have prevented normal operation and production of rated horsepower. An examination of the Cirrus Airframe Parachute System (CAPS) revealed that the activation handle was in the handle holder. The safety pin was not observed. The activation cable housing had been destroyed by fire. The activation cable was continuous from the activation handle to the igniter assembly. The igniter assembly and launch tube exhibited thermal damage. The parachute enclosure was separated from the bulkhead, and was located in the debris field beyond the main wreckage. The parachute remained in the D-Bag, and was located approximately 35 feet beyond the main wreckage in the direction of the energy path. The rocket motor and pickup collar separated from the lanyards, and were not observed. On March 1, 2003, the Federal Aviation Administration issued Advisory Circular number 61-134, "General Aviation Controlled Flight Into Terrain Awareness." The circular was issued to the general aviation community to "...emphasize the inherent risk that controlled flight into terrain (CFIT) poses for general aviation (GA) pilots." The circular defines CFIT as a situation which "...occurs when an airworthy aircraft is flown under the control of a qualified pilot, into terrain (water or obstacles) with inadequate awareness on the part of the pilot of the impending collision." According to the CFIT circular, "situational awareness" is defined as "...when the pilot is aware of what is happening around the pilot's aircraft at all times in both the vertical and horizontal plane. This includes the ability to project the near term status and position of the aircraft in relation to other aircraft, terrain, and other potential hazards." According to the Las Vegas Sectional Aeronautical Chart that was current at the time of the accident, the depicted Maximum Elevation Figure in the area of the accident site was 9,400 feet msl; the accident site was located at 8,869 feet msl. As defined in the legend of the sectional chart, the Maximum Elevation Figures (MEF) shown in the quadrangles bounded by ticked lines of latitude and longitude are represented in THOUSANDS and HUNDREDS of feet above mean sea level. The MEF is based on information available concerning the highest known feature in each quadrangle, including terrain and obstructions (trees, towers, antennas, etc.). Example: 12,300 feet would be displayed as 12³ in the middle of the quadrangle. Page Municipal Airport (PGA), Page, Arizona, had a lighted runway that was 5,950 feet in length; it was 38 nm from the accident site on a magnetic heading of 040 degrees. Grand Canyon Airport (GCN), Grand Canyon National Park, Arizona, had a lighted runway that was 8,999 feet in length; it was 34 nm from the accident site on a magnetic heading of 167 degrees. Kanab Municipal Airport (KNB), Kanab, Utah, has a lighted runway that was 6,193 feet in length; it was 35 nm from the accident site on a magnetic heading of 315 degrees. FLAGSTAFF, Ariz. - The wreckage of an overdue aircraft has been located in northern Arizona near the Grand Canyon. Around 8 a.m. on Saturday the Coconino County Sheriff's office received a call from the Arizona Department Of Emergency Management of an overdue aircraft that was last known to be in Coconino County. The aircraft was described as a White Cirrus SR 20 single engine with identification of N-365D. There was reportedly two adult males on board and was flying back from Rock Hill, South Carolina to Henderson, Nevada. Saturday afternoon a crew aboard a Civil Air Patrol search plane spotted the wreckage of an aircraft in the area of DeMotte Park on the Kaibab National Forest. Sheriff's personnel arrived on scene and confirmed the identity of the aircraft and discovered two fatalities on board. The identities of the victim's have not been released pending notification of next of kin. The last radar contact with the plane was on Friday night northwest of DeMotte Park. One of the men sent a text message to his wife indicating they were about 90 minutes from Henderson. The CCSO, the National Transportation Safety Board and the Federal Aviation Administration will investigate what caused the crash. Boeing's recent bumpy ride is justified, not all bad. Analysts explain Chicago-based aerospace giant's recent moves. Boeing Co. seems to have hit some turbulence. Its aggressive pursuit of business has left some wondering whether the Chicago-based aerospace company can keep its promises, and what will happen if it can't. Take, for example, Boeing's bid of $35 billion to supply the U.S. Air Force with 179 KC-46 air-refueling tankers. Boeing won the contract by coming in some $2 billion less than rival EADS, the European consortium that runs Airbus. But talk has begun of up to $700 million in cost overruns, with the U.S. potentially on the hook for some of it. "Welcome to the new defense-contracting environment," said Richard Aboulafia, aircraft and aviation analyst with Virginia aerospace market analysis company Teal Group. "Fixed prices in a shrinking pool means aggressive bids and possibly money-losing contracts where the contractor bears the cost and risk." Aboulafia believes absorbing $700 million could ding Boeing. "From a profitability standpoint, it will certainly hurt (Boeing) if there are more of these," he said. More of these overruns lie no further than in the commercial arena, however, most prominently with the 787 Dreamliner, the composite wide-body jetliner that is three years behind schedule. And now there are questions about its workhorse 737. The company, pondering a redesign of the jet, opted to replace its engines with more efficient LEAP-X power plants from CFM International to snag 200 jets in a 460-plane order from American Airlines. Airbus got the rest. "Airbus has really controlled Boeing's decision," said Aaron Gellman, professor of transportation at the Kellogg School of Management at Northwestern University. "Boeing should have come up with a whole new airplane, which would have trumped Airbus and caused the marketplace to be much more wary of ordering the A320neo aircraft." Gellman believes Boeing was swayed by large shareholders who are more concerned with short-term profits. "I think that's a highly risky position to take, given the competitive nature of this business," he said. "With the right leadership, you could explain the situation to investors, and say, 'Look, we'd love to put the money into dividends, but, frankly, we need to put it in product development. You'll benefit in 5-10 years,'" Aboulafia added. Still, he backs Boeing's decision not to replace the 737 with a new jet. "What are you paying for?" Aboulafia said. "Is it enough to justify any kind of new competitiveness? I don't see it." Neal Dihora, equity analyst at Morningstar, agrees on the 737. He said Boeing could have shown more courage by redesigning a next-generation 737 in tandem with what the airlines want — quicker boarding times. But re-engining the aircraft saved Boeing money, which has made its stock more attractive. It closed Friday at $70.47, down 19 cents. "In terms of a 15-year future, the decision to re-engine is slightly negative," Dihora said. "But in the short term, it's positive because the re-engine's going to bring orders in, and the way the stock usually reacts is the stronger the order book is, the stronger their earnings. Boeing's stock is going to go up because people are discounting the future." He says the 787 will play a role too. "From a long-term perspective, Boeing was willing to take risk and get a new airplane and change the way we fly," Dihora said. Dihora admits that funding the research and development phase of the 787 has created "massive cash outflow," but by 2012 that will decline and Boeing will begin to deliver the Dreamliner. "Over the next 18-24 months, we think cash flows are going to increase substantially, bringing Boeing a lot of value," Dihora said. The Chico Air Museum, a small Northern California Air and Space Museum, announced today the projected arrival date of it’s recently acquired F-15C Eagle as Sunday, July 31st. The jet will arrive at the museum after a three thousand mile truck trip, crossing eight states. The F-15 Eagle is a twin-engine, all-weather tactical fighter designed by McDonnell Douglas to gain and maintain air superiority in aerial combat. It is considered among the most successful modern fighters with over 100 aerial combat victories with no losses in dogfights. Following reviews of proposals, the United States Air Force selected the McDonnell Douglas' design in 1967 to meet the service's need for a dedicated air superiority fighter. The Eagle first flew in July 1972, and entered service in 1976. The F-15 is expected to be in service with the U.S. Air Force until 2025. The F-15 acquisition increases the number of aircraft at the museum to nine. The collection features historic military planes such as the USAF Lockheed T-33, and the Russian Antonov 2 biplane. The Chico Air Museum collection also includes exotic and unusual aircraft such as the Taylor Titch which raced in the Formula 1 Class at the Reno Air Races, and the Experimental “Dragonfly,” a very unusual airplane with forward canard wings. Mistakes by the crew and the failure of a warning system caused a Spanair jet to crash at Madrid airport killing 154 people, according to an official inquiry. The crew failed to place the airliner's flaps in the correct position when it took off from Madrid bound for Gran Canaria in August 2008, said the Spanish Civil Aviation Authority's accident report, published on Friday. An automatic voice warning which should have alerted the crew also failed to sound, said the report. The commission had already said in their preliminary report a year ago that the plane took off with its wing flaps and slats retracted. Spanair Flight JK5022 - an MD-82 jet - crashed on takeoff on August 20, 2008 as it tried to leave Madrid airport. There were just 18 survivors following what was Spain's worst aviation disaster in 25 years. In the causes section, the report says that the airliner's crew did not detect the configuration error nor 'noted the loss-of-functionality warnings nor corrected that situation after takeoff'. Following the report, the Spanish Civil Aviation Accident and Incidents Investigation Commission recommended modification of the Flight Manual linked to the aircraft's Type Certification to include opportune instructions relative to checking the Take-off Warning System. The plane overshot the runway and broke apart. GEORGETOWN, Guyana — Flight 523 from New York had just touched down and passengers were applauding the pilot's landing in the South American country Saturday when something suddenly went wrong. The Boeing 737-800 slid off the end of a rainy runway, crashed through a chain-link fence and broke in half just short of a deep ravine. Yet all 163 people on board survived. "We must be the luckiest country and luckiest set of people in the world to escape so lightly," said Health Minister Leslie Ramsammy, who said more than 30 people were taken to the hospital. Only three of those had to be admitted for a broken leg, bumps, cuts and bruises. Geeta Ramsingh, 41, of Philadelphia, recalled how applause at the arrival quickly "turned to screams." "The plane sped up as if attempting to take off again. It is then that I smelled gas in the cabin and people started to shout and holler," she said. "A fellow who was trying to escape as well mistakenly jumped on my back and that is why my knees are bruised," she said. "So I am in pain, but very thankful to be alive." Nobody had yet showed up to rescue her, "but a taxi driver appeared from nowhere and charged me $20 to take me to the terminal. I had to pay, but in times of emergencies, you don't charge people for a ride," she said, sitting on a chair in the arrival area surrounded by relatives. She was returning to her native country for only the second time in 30 years. 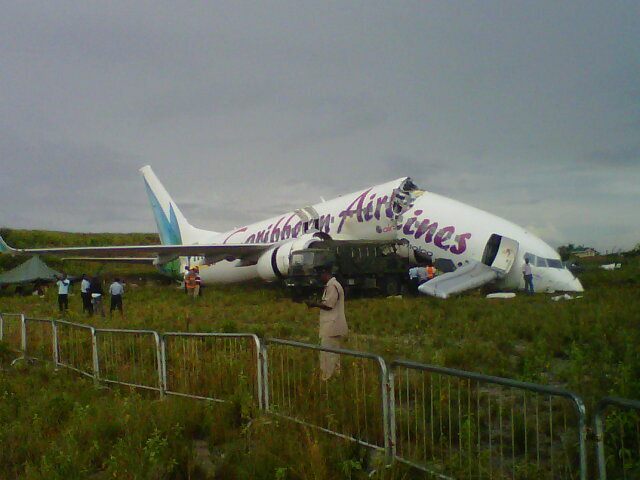 Adis Cambridge, 42, of Guyana, said she felt the thump of a hard landing but did not think much of it until seconds later. "I realized that everything was on top of me, people and bags. I was the second to last person to get off that plane in the dark," she said, surrounded by her two young children who had come to the airport to meet her after a brief holiday in the U.S.
"I hit my head on the roof. It was so scary," she said, and described jumping from the wing to the dirt road below as crews with flashlights and beams from fire engines searched for passengers. "I thought I would have died. I just started to cry," she said. The plane came to rest off the end of the 7,400-foot (2,200-meter) runway at Cheddi Jagan International Airport, which sits on a ridge in forested region just south of the oceanfront capital of nearly 300,000 people. The plane stopped a little short of a 200-foot (60-meter) ravine that could have resulted in dozens of fatalities, said President Bharrat Jagdeo. "We are very, very grateful that more people were not injured," said Jagdeo, who came to the crash site before dawn. George Nicholas, Caribbean Airlines chairman, told reporters that officials with the U.S. National Transportation Safety Board are scheduled to arrive Sunday in Guyana to take over the investigation. He said investigators from Guyana and Trinidad, the airline's base, will help. Authorities temporarily closed the Guyana airport, leaving hundreds of passengers stranded and delaying dozens of flights. The main terminal reopened late Saturday morning to only a couple of small planes, including a LIAT airline bound for Barbados, said Orin Walton, a local representative for the Antigua-based carrier. The crash of Flight 523 is the worst in recent history in Guyana, and only one of the few serious incidents involving the Trinidad-based airline. It is the single largest carrier in the region, operating at least five daily flights. US investigators to probe plane crash. Caribbean Airlines Boeing 737-800, 9Y-PBM, Flight BW-523. Georgetown, Guyana. American investigators are due in Guyana Monday to remove the blackbox and data voice recorder of the Caribbean Airlines plane which crash-landed at the Cheddi Jagan International Airport (CJIA) early Saturday. Airline Chairman, George Nicholas said the probe is being spearheaded by the Guyana Civil Aviation Authority and will include personnel from the US National Transport Safety Board (NTSB). Meanwhile, Trinidad and Tobago's Prime Minister Kamla Persad-Bissessar is expected in Guyana Saturday evening for a first hand assessment of the situation. The airline is the national carrier of the twin-island republic. Steel barricades, manned by armed police and soldiers, have been erected around the aircraft to secure it for the investigators. Demerara Waves Online News (www.demwaves.com) observed items being removed from the aircraft and loaded into an army truck. Nicholas called it a miracle that the US$38 million aircraft acquired in 2007 did not catch a fire or persons were not killed or more seriously injured. "It's an absolute miracle that took place today," he told a news briefing at the CJIA. "It's amazing to have an aircraft in that shape with a small number of injuries." Nicholas and other senior management officials, who flew in from Trinidad, declined to speak about the weather, how equipped was the airport control tower and other matters that could impact on the investigations in connection with Flight BW523. The airline officials, however, assured that the pilot has been flying for 25 years and has been doing so to Guyana over that same period. The Georgetown Public Hospital Corporation (GPHC) Saturday afternoon released a list of 35 persons who were seen at the institution, three of whom have been admitted as patients. Hopetown who suffered a cerebral concussion and trauma to the abdomen. She too was admitted to the Female Surgical Ward. The Diamond Diagnostic Center also treated 17 patients with 11 being referred to the GPHC while were six sent home. "We will continue to be alert throughout the coming days for passengers who may experience any pain or trauma," Health Minister Dr. Leslie Ramsammy said in a statement. 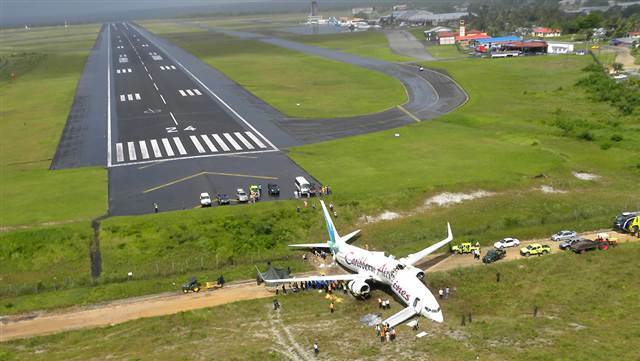 Caribbean Airlines spokeswoman, Laura Asborjornsen said a team of Caribbean experts would be arriving in Guyana to assist with "post trauma" counselling for the passengers and crew members. Scores of persons who arrived on the flight expressed concern about the delay in getting their baggage. "We want to know why so long we can't get we baggage," one passenger yelled at a Caribbean Airlines staffer who was trying to calm an increasingly tense situation. However, airline officials said all personal belongings inside the cabin were being collected and placed in individual plastic bags corresponding with each seat. The incident occurred around 1:25 AM when the jet ran off the runway and down a slope where it broke in two. There has been no official word on the weather conditions at the time of the incident.Flights in and out of the airport have resumed while feverish efforts are underway to retrieve the baggage belonging to the 151 passengers and six crew. Cairo - Around 300 passengers were evacuated on Friday from an Egyptian plane after a fire in the cabin, official sources at Cairo airport said. The plane was about to take off for the Saudi city of Jeddah when the fire erupted, they said. Firefighters extinguished the blaze before it could spread. 'No passengers were harmed. They were evacuated quickly as the plane was still on the runway,' the sources said. The cause of the fire is unknown. The sources said the pilot of the aircraft had attributed the fire to an electric failure. AHMEDABAD: Lata Bhatt had hoped to fly to Delhi from Ahmedabad on Saturday morning, but instead landed in a disagreeable situation. Bhatt had booked a ticket on Air India IC817 Ahmedabad-Delhi flight that departs at 8.10 am. However, she was unable to board the aircraft after she got into an argument over excess baggage with airline officials. Bhatt moved to Osaka, in Japan, from Ahmedabad 10 years ago and had booked a connecting flight to Osaka from Delhi on Saturday night. Bhatt said that she was carrying around 15 kg more than permitted, for which airline officials asked for more than Rs 10,000. "I am a frequent flier with Air India and am allowed to carry 10 kg extra and was ready to pay for the additional 5 kg," she said. "But they made an unreasonable demand of Rs 10,000. I told them I had a connecting Air India flight from Delhi to Osaka at 10 pm on Saturday. But they refused to heed my concerns and didn't allow me to board the flight." "I contacted airport manager R Bagde who got a ticket on an Indigo Airlines flight that departs at 10.30 am. I paid Rs 1,500 to Indigo Airlines for the 15 kg extra baggage," Bhatt said. Bhatt, who runs a restaurant with her husband in Osaka, added that she would never fly Air India again. "I have never faced such problems in Japan. Airline officials treat passengers politely and listen to their concerns. But in India, even the basic courtesy is lacking," she said. However, Air India officials said that Bhatt had created unnecessary ruckus and was carrying 20 kg of extra baggage. Passengers flying on Air India from Ahmedabad and having connecting flight to Japan from Delhi are allowed to carry 20 kg as check-in luggage and 7 kg in hand. "She can carry only one suitcase and a handbag, but had three suitcases and two handbags weighing more than 40 kg," said an Air India official. "She began arguing with the ground staff when she was asked to pay for the excess luggage. When she refused to pay, we cancelled her ticket and gave her a complete refund." ALASKA: Emergency crews respond to mid-air collision. Mat-Su Borough emergency crews were called at about 2:30 p.m., Saturday to respond to a mid-air collision near Amber Lake Road in the Trapper Creek area. One plane is reportedly down and in flames on Amber Lake Road and the other plane has only minor damage to a float and is attempting to return to Lake Hood in Anchorage. No information about the downed plane’s airport of origin or survivors is available, so far. This is a breaking news story and we will update you as more information becomes available. ROCK HILL, S.C. -- A plane departed from Rock Hill on its way to Nevada has crashed near the Grand Canyon. Coconino County Sheriff's air units have located what they believe is aircraft wreckage in the Kaibab area near the North Rim of the Grand Canyon. The FAA tells NewsChannel 36, it’s a single-engine Cirrus SR20 plane that departed from Rock Hill Airport-Bryant Field headed for Henderson, Nevada. There was only one pilot on board the plane. The pilot’s family reported him missing when he didn't show up at the airport in Nevada Friday night. According to the FAA, the pilot was not communicating with air traffic controllers. A review of radar data shows the plane disappeared from radar over the Grand Canyon around 9p.m. Friday. Chopper crash claims pastoralist. Australia. VIDEO: China's New Aircraft Carrier "For Study"